German cleantech innovator Fuelsave GmbH has received a funding boost to complete the development of FS MARINE+, that is the world’s first hydrogen-powered engine assistant unit for shipping vessels. 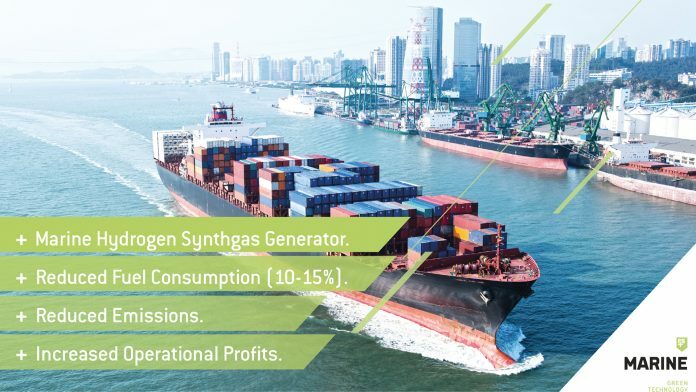 The patented hydrogen generator produces a proprietary synthetic gas that is injected into a ship’s engines to significantly improve combustion efficiency. The vital maritime transport sector is large and growing, but at the same time, it must reduce the ecological impact from its highly polluting heavy fuel, which contributes 2.2% of global carbon dioxide (CO2) emissions. The European Commission (EC) has set a goal of reducing maritime CO2 emissions by 40% by 2050. Shipping companies are struggling to reduce fuel costs and to stay profitable. Fuel comprises 50-60% of all shipping industry expenses and maritime bunker fuel prices are rising quickly. Shipping companies must invest in energy efficiency measures, at a time when their financial capacity to do so is limited. In addition, diesel-powered marine engines suffer from very poor fuel efficiency due to their high operating temperatures and slow combustion. A significant proportion of energy produced is wasted due to inefficient engine operation. Reduce net fuel consumption by at least 10%. Cut carbon dioxide (CO2) emissions by at least 10%. Cut nitrogen oxide (NOX) emissions by at least 50%. The customizable unit can be installed on any vessel and amortized within three years, making FS MARINE+ the most viable technology for improving the global shipping industry’s environmental and economic challenges. The project goal is to complete development and commercialize the FS MARINE+ technology for global markets. The total budget is 2.3 million €. The schedule is 2018 – 2020.